When promoting events on Facebook your first thought might be to create an “Event”. It makes sense because that’s what that feature is for. You’ll also be posting updates periodically, reminding “likers” that your event is going to be a blast and that they should attend. While this is fairly standard and updates should be posted, there are better ways to creatively promote your events. Creating simple, well designed Facebook tabs can add that little extra when promoting your events. You get to personally design how the tab is displayed for people who like your page as well as people who are not currently fans. 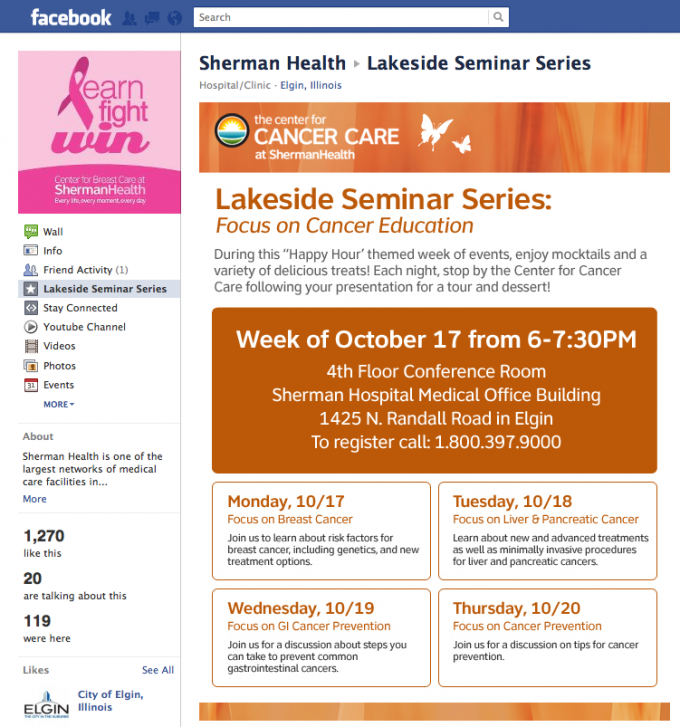 Below is an example of a Facebook tab that we created for Sherman Health’s Lakeside Seminar Series. Not only does that tab show off the brand of Sherman’s Center for Cancer Care, but it also allows people to register for the seminars. Each class links to its respective registration form. Sure you can include these links in the Facebook Event you created, but you can’t display it creatively like this. Interested in what else we can do with Facebook? Click here.